Transfering contacts from phone to phone, or from one SIM card to another, may look easy..there are a lot of apps doing the job after all. WRONG. You might disgracefully realize that most of the apps on Google Play (if you are using an Android operating system) pretending to do this not even read a vcf file, and yet grab your phone memory. 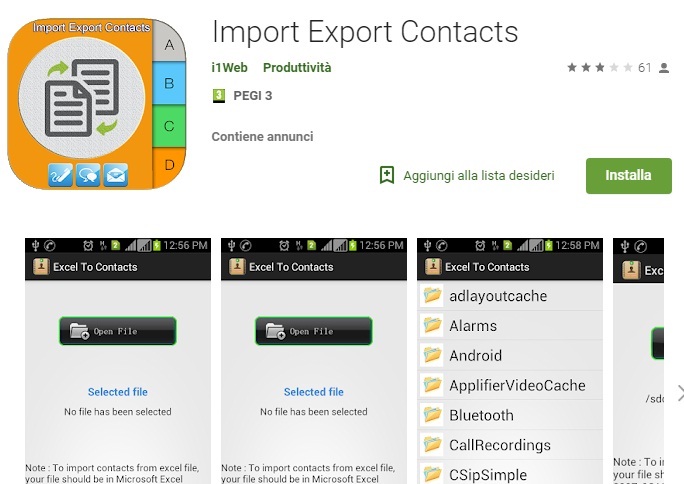 The only app working is named Import Export Contacts, is free and allows you to import contacts from the a vcf file chosen from the phone’s memory through a single command. A second version, named Import Export Contacts Pro, has also been released, which is always free and also associates more features. Striking Fact: it is an app from India and has just 3 stars out of 5 even if it’s the only app working. Once the app is open, click on “Open File” and select the file to import. After selecting it, press the “Import” or “Import Excel” button. Don’t care so much about that “Excel”, it also imports vcf files. After that, just go see the phone book to see that all the contacts have been imported.